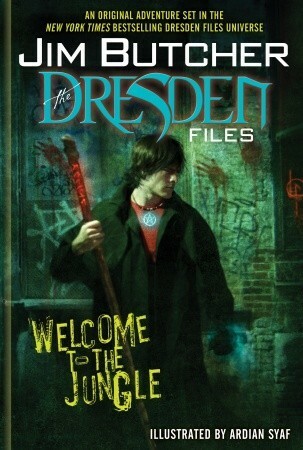 First one out of my November reading is Jim Butchers graphic take on the Dresden files. Don’t know why I haven’t come around to read any of his books, it strange for they should be right up my alley. So when I found the graphic adaptation, Welcome to the jungle in the bookshop the other day, well let’s have a go at that, all I can say now, I’m hooked. For all of you that’s not familiar with the Dresden Files, it is set in a world similar to our own, regular folk close their eyes or look the other way when things goes bump in the night, they try to rationalize when the supernatural world crashes with what is considered normal. Here we meet Harry Dresden, professional wizard, a police consultant and private investigator. This story begins with the brutal killings of a man at the Lincoln Park Zoo, Harry gets a call from lieutenant Murphy of the Special Investigations asking him to have a look at the scene and when he gets there he senses that there is more to this killing then just an ordinary animal attack. During his search for clues that might lead him and the police in the right direction of who or what killed the man, he starts to realize that he might be next in line. There is a pace and urgency in the way Butcher is telling his story, the reader gets drawn into this world filled with magic, demons and things that seems ordinary on the surface but is far, far from it. The illustration is stunning; colors are deep and rich, a bit more to the dark palette, but oh so beautiful. Ardian Syaf has done an excellent job, I’m looking forward to see more of his work. My thoughts after reading this novel go to works like Dave McKean’s Black Orchid or Frank Miller’s innovative take on Batman in late 80s. And Jim Butcher actually mentions Frank Miller in his introduction, as an example when comics became graphic novels. In the introduction he also states that this is his view of his characters, especially Harry is spot on to how he imagine him in his own head. So page after page, we see the authors vision of some of his characters from the books. I enjoyed this graphic novel immensely! It was fun, filled with humor and action, the story is engaging and interesting and as I mention above the illustrations are stunning. I just fell in love with this edgy, worn down (anti) hero that is Harry Dresden. I can recommend this to all of you out there who like a good urban fantasy story, and off course to all Harry Dresden fans (if you missed this one), this is a new story set in time just before the novel Storm Front. I strongly recommend, read it! !